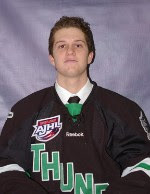 The St. Thomas Tommies back end is starting to take shape for the 2010-11 season as Felix-Antoine Poulin has announced his intentions of playing at STU this fall. This past year Poulin led the entire Alberta Junior Hockey League (AJHL) in points with 61 and was nominated for the leagues top defenceman award. Prior to moving out west the swift skating D-man played junior hockey in the QJAAAHL and was that leagues top defenceman and leading point getter from the back end in 2009-10. At 6'2" and 200 pounds Poulin should be a big help for STU's rebuilding blue line. GOOD news on the 2 committments announced in today's Gleaner. Sanza should be some combination of Mike Hansen and Matt Hogan and will be welcomed by Tommies Nation as such.........I do not know VanLaren but he is highly recommended by former STU scout Brian Wright. If the other expected 5 or 6 recruits measure up to this beginning then we fans are going to have a very,very enjoyable winter.